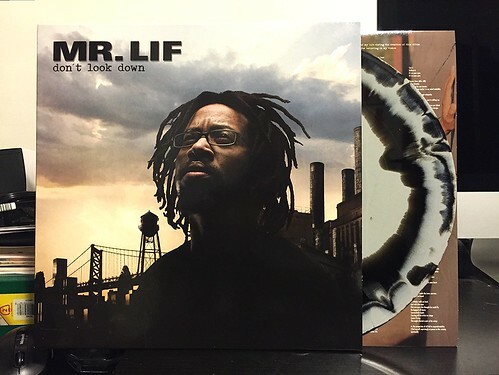 When I picked up the I Phantom reissue a few months ago, I was surprised to see that the same label also had a pre-order up for a new Mr. Lif album. Eager to hear more from one of my favorites, I ordered a copy right away. This is the first Mr. Lif album in quite some time and other than the obligatory Del The Funky Homosapien album every couple of years, it this first new hip hop album I've picked up in a long, long time. Sadly, as a whole I'm kind of disappointed. The album definitely has its highlights. The one-two punch of the first two tracks, "Pounds of Pressure" and "The Abyss" set up some pretty high expectations. The beats are full and uptempo and Lif's rapping is as dynamic and exciting as ever. Unfortunately the album goes downhill quickly from there. "Everyday We Pray" is a slow muddled song with a good lyrics, but boring production. Things seem like they're going to pick up with "Let Go." Its bouncy beat and keyboard samples immediately make me think of "Passin' Me By" by The Pharcyde. Mr. Lif takes full advantage of the old school sound, but unfortunately this is one of two songs virtually ruined by unnecessary R&B style crooning added in by some singer I'm not familiar with. I've always hated when solid rapping is interrupted with nonsense singing. It just doesn't work and the exact same thing happens on the very next song "A Better Day." Fortunately there are a few saving graces. The Edan produced "Whizdom" is a real standout as Edan provides a strong, oddly paced beat that really gives Lif a platform to showcase his style. Lif's collaboration with Del The Funky Homosapien, "World Renown" also provides some solid lyrics from both, although the beat isn't particularly enthralling. That's really the problem with this album in a nutshell. The beats are slow and uninspired. Mr. Lif has such a unique style and the way he structures his lyrics stand head and shoulders above most, but if he doesn't have off kilter and innovative beats that compliment this, it just takes him down a level. While I wouldn't go so far as to say this is a bad album, because the good songs are pretty good, it's definitely the weakest Mr. Lif album to date. If I had heard it before I went to buy it, I may have passed.